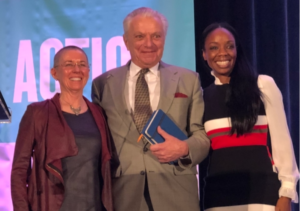 From ACEs Connection: “After three days of inspiring presentations, panel discussions and breakout sessions at the National ACEs Conference, the crowd of 850 people was eager to hear from two of the ACEs movement’s pioneers: Dr. Vincent Felitti and Dr. Nadine Burke-Harris. During a luncheon plenary on the last day of the conference, which was held Oct. 15-17 in San Francisco, Felitti related a story about what happened when he first broached the subject with colleagues of asking patients to fill out a questionnaire that included questions about their childhood trauma. They thought he was crazy, he said. ‘They thought [the patients] would decompensate,’ he told a packed ballroom.